Uncommon sky, meet common kitchen counter. We’ve got more than 90 breweries in B.C. 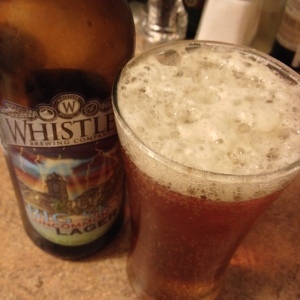 these days, and yet here I am back at the Whistler Brewing trough. Whistler promises as “hop forward clean finish” and I have to say, they’ve delivered. This is the most literal interpretation of hop-forward, clean finish you could hope to find. On taking a sip of Big Sky you’re immediately hit with all of the beer’s flavour. And where the back of the sip, your end notes, your aftertaste, should be there’s… nada. Instead, you have the strange experience of the hop taste just sort of evaporating out of your mouth, even as you still feel like you’re drinking. It’s like Jesus in reverse — beer into water, with maybe a hint of metal. It’s pretty entertaining. The slower your sip, the more pronounced the experience is. It took me entirely too long to get through a glass of this stuff because I was trying to see how far I could push the sensation. And you don’t have to worry about feeling weighed down when you’re through your first pint. Big Sky is its own palate cleanser. But, I feel like the punch of beer flavour at the front doesn’t allow for complexity. The toasty and hoppy flavours end up trampling all over each other, stifling their best characteristics. I found myself wishing Big Sky could cool its jets, give me more time to get a handle on its flavours before everything swept away. Faults aside, if you can still track down a bottle (this was one of Whistler’s summer releases, though I found a good batch of it at one of my local stores) I’d give it a go. Makes a heck of a party trick if you’re the right kind of dork. Posted in Beer. Tagged 650mL, weird beer honour roll, Whistler. Nothing but the classiest taste-testing environs for Bad Rider. Four-Way Fruit is a mix of mango, passion fruit, pomegranate and raspberry — a combination that sounds like it could be the basis for one of those Sesame Street ‘one of these things is not like the other’ segments. As we sipped our way through our samples, I found myself thinking about those grocery store juice blends that are advertised as raspberry cocktail, but mostly contain apple and grape juice concentrate. In the same vein, Howe Sound’s four fruits fuse together into something completely different from the sum of their parts. Without the benefit of the ingredients label in front of you, this could easily pass for a peach or pear beer, with an unusual, tropical edge. But with the cheat sheet some of the truth starts to emerge. Mango is the dominant flavour, and while I’m not sure I ever did taste the pomegranate or passion fruit, but there’s a nice raspberry round off that manages to stay on the right side of the tart/sour divide. Beyond its mysterious fruits, the brew is very carbonated compared to many of its fruit beer contemporaries, and on the lighter end of the spectrum, which keeps it from becoming cloying or sryupy. As far as odd summer beers go, I’m calling this one a winner. Since it’s already September I’d advise drinking while you can still feel the rays on your face. 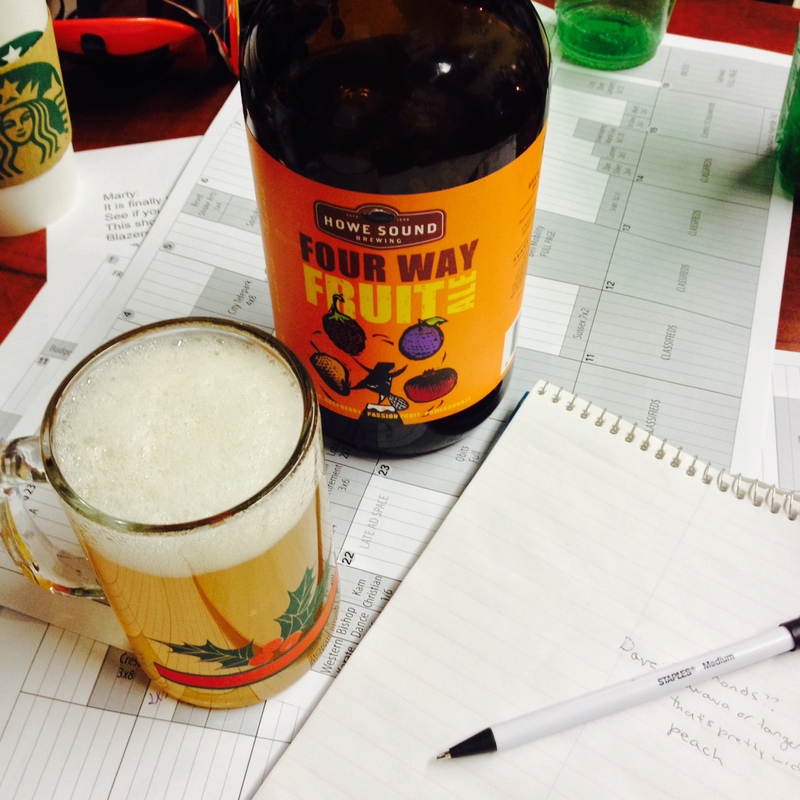 Though it’s a year-round beer, I’m betting Four-Way Fruit is at its best before the mercury drops. Posted in Beer. Tagged 1L, fruit beer throwdown, Howe Sound Brewing Co., Squamish B.C., weird beer honour roll. Well, it only took a handful of reviews for Bad Rider’s beer side to mess up its mandate. Those of you who actually read the specs part of this post and pay much attention to the industry will note that Big Rock is not a B.C. brewery. It’s not even a particularly small brewery — per Wikipedia it’s got more than 500 employees and is publicly traded — but the BCLC near my office was fairly devoid of fruit beers when I breezed through over the weekend and I’m not ready to give up this conceit quite yet, so here we are. Believe you me, readers, of the bunch of us I’m the one paying the price. I love hefeweizens, white beers, wheat beers of all stripes. And on that front, Cherry Bomber is utterly adequate: Not too heavy, smooth on the tongue and with a slight touch of sweetness. I wouldn’t say it distinguishes itself much, but it’s still better than many of the offerings on tap at your average commercial sports bar. That being said I will be damned if I can taste any cherry flavour in it. I’ve raised this complaint before, back when Fernie’s What the Huck was up for review, but this isn’t that situation. At least with Fernie there were licks of berry flavour around the edges — “a faint hint of Growers Orchard Berry Cider” in my uncharitable assessment. This time, I got nothing. As I made my way through the first few tastes of Cherry Bomber I thought I detected a certain cherry sweetness in the finish of my sips, a slight, fruity aftertaste. But, by the time I’d finished half a glass of Cherry Bomber it was gone, never to return. I can’t help but feel cheated. But that’s what I get for trying to cheat. It wasn’t all bad news on the fruit beer drinking front this week, however, and since we’ve already strayed off course, let me recommend an American sip I had the pleasure of trying: Lost Coast Brewery’s Tangerine Wheat Ale. It’s super refreshing and super bizarre, and absolutely a candidate for my weird beer hall of fame. Posted in Beer. Tagged 650mL, Alberta, Big Rock Brewing Co., fruit beer throwdown, US beers, weird beer honour roll. Penticton, you sure know how to confuse a lady. Guys, I want to bathe in this beer. Or maybe not bathe — stickiness factor — but daub it behind the ears and on wrists, perfume style. I would buy candles that smell like this beer. Junior high-aged Andrea would buy large bottles of a body mist version of this beer for dousing herself with after gym class. When Tin Whistle claims to have captured the aroma of peaches, they are not screwing around. Within a minute of popping the top off the top of the bottle, my workspace smelled like I was being a responsible adult and eating fruit, instead of making tasting notes about beer after eating popcorn for dinner for the second night in a row. The peach flavour is natural, not chemical like candy, and dominates the beer. It’s not so much the fruit is overwhelming, as there’s very little to taste in the way of malt or hops. I feel like it’s what you’d get if you soaked sliced peaches in Pabst Blue Ribbon, spa-water style. What didn’t work for me so much is that this beer also lives up to the cream part of its name. The milky finish took some adjustment for me and felt a bit strange in a beer that was so un-beery in taste. 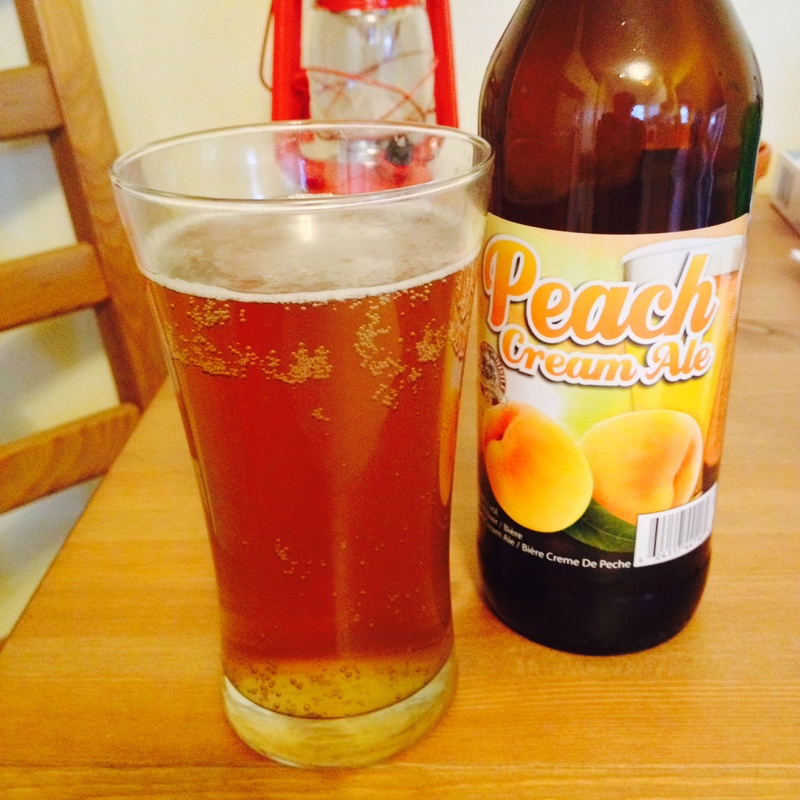 All told, I’m not sure if this was pleasant but not really my thing, or if I want to buy 50 bottles of Peach Cream Ale and mail one to every beer drinker I know to try to get some consensus. But if you like very pale ales and want to try something unusual, I think it’s worth the $6 or so it’ll set you back, if only for the cologne factor. Posted in Beer. Tagged 650mL, fruit beer throwdown, Penticton, Tin Whistle Brewing Co., weird beer honour roll.